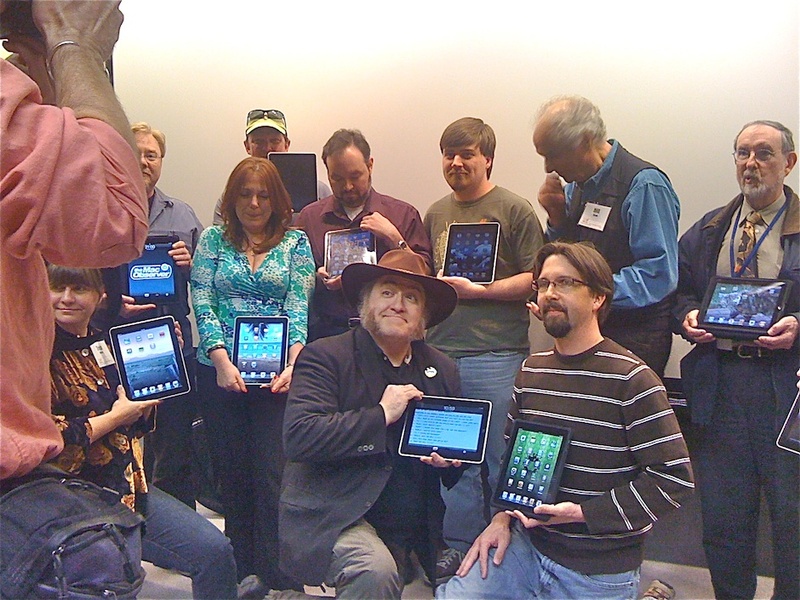 The geeks were out en masse showing off their finger-smudged, er, shiny new iPads at the Thursday, April 8, meeting of the Colorado Macintosh Users Group (COMUG) at NCAR. The headline speaker for the evening, sporting his trademark leather hat, was Andy Ihnatko, a legendary figure among Apple cognoscenti, tech columnist for the Chicago Sun Times, and faithful annual attendee at the Conference on World Affairs at CU and the neatly coinciding COMUG meeting (links to all 10,000 words of Andy’s iPad coverage on this Sun-Times web page). COMUG meetings, a place for rarefied information exchange and cult-like worship of everything Apple, occur the second Thursday of every month up the hill at NCAR. In this subculture, the appelation of “geek” is acknowledged with pride. The prospect of Ihatko’s annual visit — plus a chance for group-worship of the new iPad — drew about 80 to Thursday night’s meeting. Driving up to NCAR (and maybe spending a bit of time outside beforehand) is a spectacular scenic pleasure, especially in the summer. Getting there by bicycle would be invigorating and nice for the planet. Dress code is propeller heads optional. For those trapped at home, the meetings can be viewed live by video webcast from the COMUG website. You can also subscribe to a video podcast of meetings by typing “COMUG” into the iTunes Store on iTunes. Even (gasp!) on a PC.